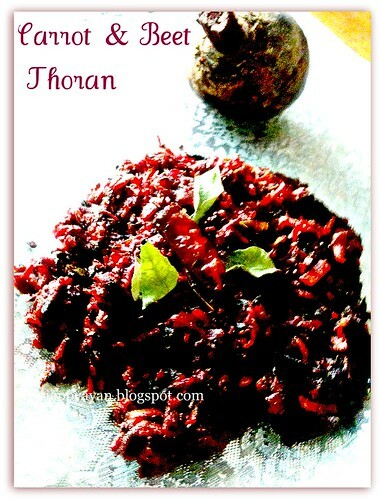 Thoran is a dry dish, originated from Kerala Cuisine, cuisine of South India, traditionally made with finely chopped vegetables like, beans, cabbage, carrot, Tomato, Spinach etc. The chopped vegetable is mixed together with grated coconut, Mustard seed, curry leaves, green chillies and turmeric powder and briefly stirred on a pan over a very hot fire. It makes a very delicious side dish with rice and rotis and no doubt it is very healthy as not much spices and oil need to make it. 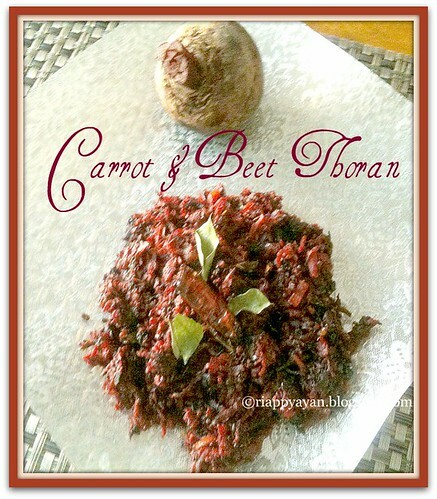 I just love the taste of thoran and made many varieties with only cabbage, caroot, sometimes cabbage-carrot combo, this time I tried with Carrot and Beet and it was a yummy accompaniment with chapatis. I didn't add coconut in this thoran, as I was out of it. But it tasted yummy without the coconut, I must say. Cumin seed : 1 tsp. Grate carrot and beet coarsely, not very fine. Keep them aside. Heat oil in a pan, lower heat to medium, add dry red chilli first, then urad and chana dal, when they start to brown, add mustard, cumin seed and curry leaves. Before they turn to dark brown, add chopped onions. Stir fry onions for few minutes, then add chopped ginger, garlic and green chillies. Stir fry for a minute, then add grated carrots and beets. Mix with the spices, add turmeric, a pinch of red chilli powder and salt. Stir and mix well with the spices. Cover the lid and let it cook in medium flame for 5-6 minutes. Stir time to time to avoid burning. When veges are done, add a pinch of sugar, stir and remove from heat. Note : The main taste of this dish comes from the tempering ingredients. So temper it properly, do not burn, then taste will be spoiled. 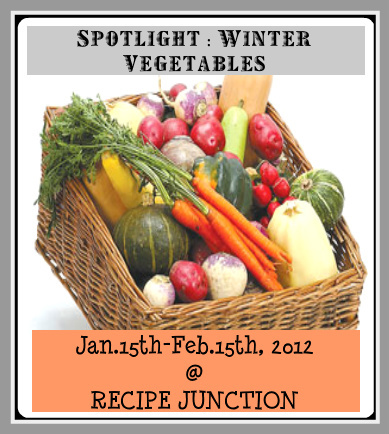 This is going to my event "Spotlight : Winter Vegetables"
and to Kaveri's event "The Kerala Kitchen"
I will have to try this asap. Thanks for sharing! Perfect with hot steaming rice. Nice combo of veggies thoran. Very healthy also. Super healthy and definitely satisfying delicious thoran. Colourful and delicious. 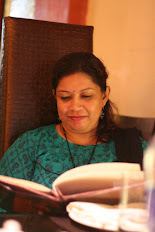 My 1st visit here, nice space following you. A delicious and healthy thoran..